Thione Niang étant un invité Américain, la conférence sera entièrement en anglais. L’Agora, the conferences and debates’ society of EDHEC, in association with « Schola Africa », is pleased to welcome Thione Niang on Tuesday 22nd of March at 17h30 at EDHEC. Thione Niang is the one who was at the heart of Barack Obama’s presidential campaign and current director of International Relations for the Young Democrats of America. On Tuesday 22nd, come to attend the first international conference of L’Agora which will be entirely in English. Although he is only 31, Thione Niang’s already a symbol of multi cultural success. He was born in Médina Kaolack, in Senegal, the twelfth in a family of 28 children living in extreme poverty. In 2000, he left Senegal to go to New York. In 2005, he became involved in politics. 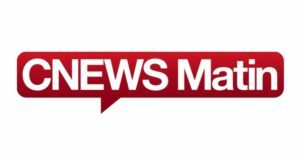 Straightaway, he became campaign director for the Democrat candidate for the city council in his district of one of the biggest cities in the United States, Cleveland, Ohio, before becoming deputy campaign director for the Democrat candidate for Mayor of the city. Then he moved to the heart of Barack Obama’s presidential campaign. Today, he is a political leader and consultant. 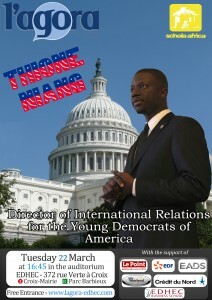 Thione Niang is Director of International Relations for the Young Democrats of America. He created the Give One Project in Senegal, an association which fights to encourage young men and women to strive for greater social, economic and political participation in their communities.